Kale is one of the most used vegetables in our household. Each week I go along to our local farmers market and I buy three huge bunches of it for £1 to have with various meals throughout the week. Baked, wok’d, steamed or raw, Kale is one of the worlds most nutrient dense foods and is ever so versatile. Packed with essential vitamins A, C and K as well as minerals like copper, potassium, iron, manganese and phosphorus kale has a multitude of health benefits. It also contains an antioxidant known as alpha-lipoic acid, which has been shown to lower glucose levels, increase insulin sensitivity and prevent oxidative stress-induced changes in patients with diabetes. It’s so easy to pick up a dip from your local supermarket, but I find that in just one tiny pot you will find an array or sometimes incomprehensible ingredients that are of no benefit to your body or health. I completely understand that time is of the essence for all of us, and that sometimes it is easier and more practical to just pick something quick and pre-made. For research purposes I recently checked out the back of a simple guacamole and this is the list of ingredients: Avocado (70%), Double Cream (Cows’ Milk) (15%), Tomato, Sugar, Concentrated Lime Juice, Onion, Red Chilli, Coriander, Antioxidant: Ascorbic Acid; Salt, Garlic Purée, Rice Starch. Although this isn’t the worst list of ingredients I’ve seen, it’s still pretty shocking when you think it’s just a simple guac! 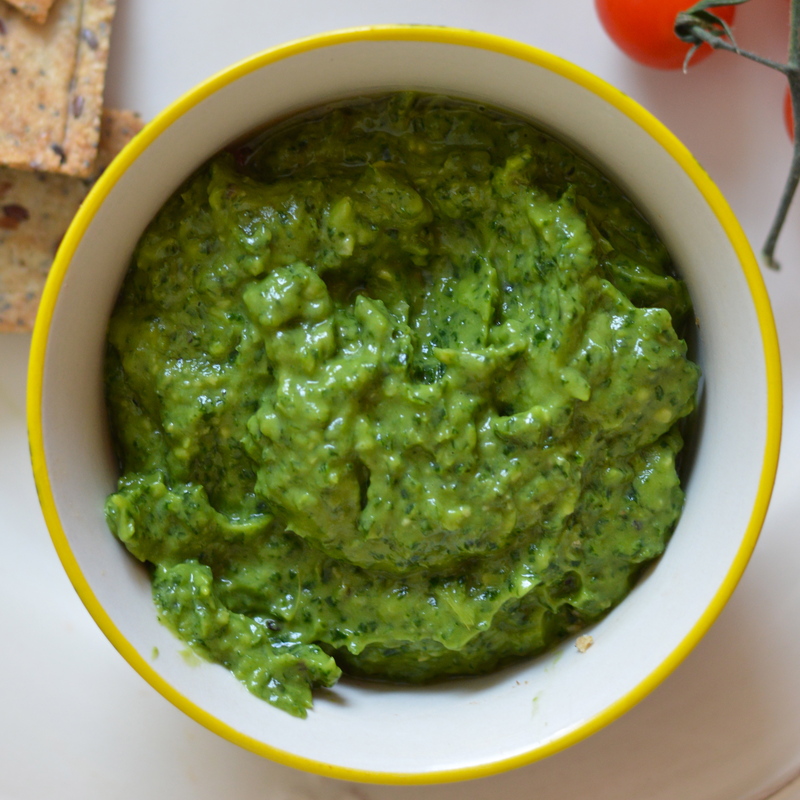 So, here’s my own flavour and nutrition packed green dip, it takes 5 MINUTES to make and can be tubbed up and transported straight away! It’s safe to take along to a picnic as it’s nut-free, dairy-free, gluten-free, sugar-free and grain-free so it caters for everyone. If you do not like garlic then feel free to miss it out. To me there is nothing better than homemade, especially as you know exactly what you are putting in your body and with this dip there’s certainly nothing to feel guilty about. Simple ingredients and a great dip with crudities, sea salt multi seed crackers or some olive and sea salt crackers . A creamy, antioxidant packed avocado and kale dip. Perfect for sharing or adding as a garnish to a salad.